There are over 3000 operators in the state of New Mexico. Most of these operators are inactive, but are still in the database. If you select an operator that has had no reported production since 1993, you will not get back any information. You may either search the entire operator list (A-Z), or for quicker response, select one of the smaller lists (A-F, G-Q, or R-Z). There are thousands of pool names in the well database. Many of these pools no longer produce, but are still in the database. If you select a pool that has had no reported production since 1993, you will not get back any information. You may either search the entire pool list (A-Z), or for quicker response, select one of the smaller lists (A-F, G-Q, or R-Z). 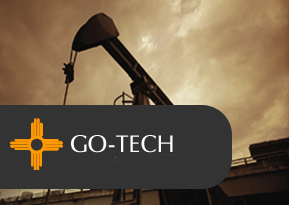 The New Mexico Bureau of Geology and Mineral Resources Oil and Gas Program operates a web site, located at oil gas pool maps which provides maps of the various producing pools in New Mexico. The pool maps are tied in to the GO-TECH production database, so data is available for single wells via the map. Oil and gas production is primarily located in two regions of the state, the northwest and southeast corners. The northwest corner is the primary gas producing region, with San Juan County generating most of the production. The southeast corner of New Mexico primarily produces oil, with Lea and Eddy counties accounting for the majority of production. The New Mexico Bureau of Geology and Mineral Resources Oil and Gas Program operates a web site, located at (http://geoinfo.nmt.edu/resources/petroleum/) which provides a brief introduction to the geology of these regions.